May 12, 2016 – A student-built CubeSat will be deployed from the International Space Station on Monday, May 16, at 4 a.m. MDT. Data from the mission will be used to refine forecasts made by NOAA’s Space Weather Prediction Center and the satellite drag models produced by the U.S. Air Force. The Miniature X-ray Solar Spectrometer (MinXSS) is a 3-Unit (3U) CubeSat developed at the University of Colorado-Boulder’s Laboratory for Atmospheric and Space Physics (LASP). More than 40 students have contributed to the project with professional mentorship and technical contributions from professors in the Aerospace Engineering and Sciences Department at CU and from LASP scientists and engineers. CU Professor Tom Woods is the MinXSS principal investigator. Dr. Scott Palo and Dr. Xinlin Li serve as CU AES faculty advisors. At any given moment, the sun emits a range of light waves far more expansive than what our eyes can see: from visible light to extreme ultraviolet to soft and hard X-rays. When observed and analyzed, those wavelengths can provide scientists with valuable information about the sun’s activity and its effects on Earth. MinXSS will fill a critical spectral gap in solar measurements currently made by large satellites – providing a bridge between the hard X-ray spectral measurements by the Reuven Ramaty High Energy Solar Spectroscope Imager (RHESSI) and extreme ultraviolet spectral measurements by the Solar Dynamics Observatory (SDO). To overcome these technological challenges, MinXSS employs an “X-123”, a primary instrument developed by Amptek, Inc. that will allow for functional, daily measurements of soft X-rays for the first time. The Amptek X-123 is a commercial-off-the-shelf (COTS) silicon drift detector. Its low mass, modest power consumption and small volume make it ideal for use on a CubeSat. Understanding the energy distribution of solar flare soft X-ray emissions will help scientists understand, and hopefully mitigate, the impact of space weather activity. This activity can impact telecommunications and navigation systems and in a worst-case scenario, can disrupt the power grid for months, or even years. Data from MinXSS will help scientists better understand where in the Earth’s upper atmosphere the energy from a solar flare gets deposited and what impact that will have on daily life on Earth. MinXSS solar X-ray measurements will also provide new insight into the energetics of solar flares and the composition of the highly-variable solar corona where flares originate. Once MinXSS is deployed, it’s expected to have a 5-12 month orbital lifetime, dependent on atmospheric conditions. During the mission, scientists expect there to be dozens of solar flares for MinXSS to study in detail. The hardware for MinXSS is a mixture of custom development and commercial products. CU students and their mentors custom-designed and developed the structural bus, electronics motherboard, electrical power system, solar panels, command and data handling board, fine sun position sensor, and broadband X-ray photometer. Purchased flight items includes a UHF radio from AstroDev, high-efficiency triple junction solar cells from Azurspace, and the x-ray spectrometer from Amptek. To keep itself oriented toward the Sun, MinXSS incorporates a unique 3-axis attitude determination and control system built by Blue Canyon Technologies (BCT), a Boulder-based aerospace company founded by CU-Boulder graduate George Stafford. The control system should offer an unprecedented level of accuracy and precision and could be widely use in future CubeSat missions. 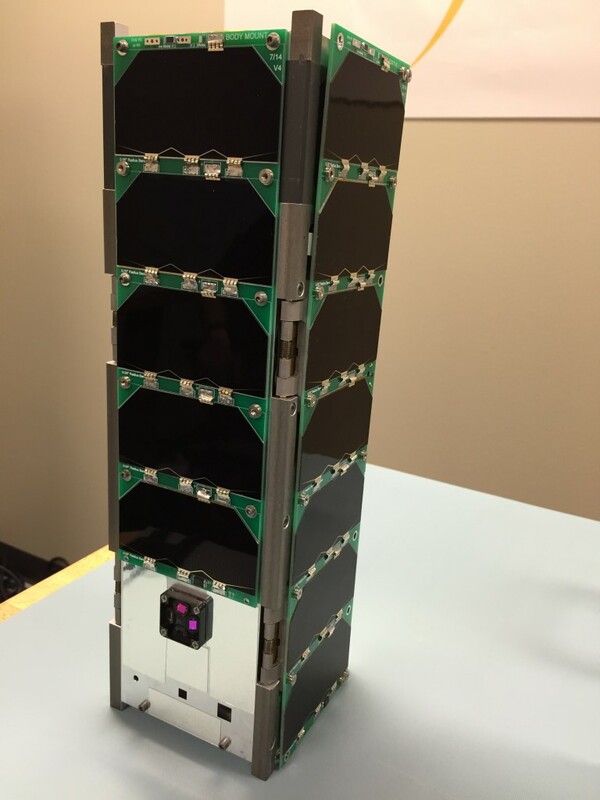 The MinXSS CubeSat is the latest example of the university’s commitment to advancing aerospace technology and space science through strong partnerships with industry and government. MinXSS continues a robust tradition of CU-Boulder students designing and flying CubeSat missions, including the highly successful Colorado Student Space Weather Experiment, which launched in September 2012. MinXSS was launched to the International Space Station via a United Launch Alliance (ULA) Atlas V rocket on December 6, 2015. It was carried aboard Orbital ATK’s Cygnus cargo resupply spacecraft. Doctoral student James Mason has worked on the MinXSS CubeSat project since 2011 and said it has been the most valuable and exciting part of his aerospace engineering education at CU-Boulder.